This entry introduces some common tool wear suppression methods of diamond-cutting ferrous metals. Natural single crystal diamond has many advantages such as high hardness, high thermal conductivity, low friction coefficient, low adhesion, high wear resistance and so on. It can be machined extremely sharp cutting edges, and the diamond-cutting has ability to form very thin chips . In the process of ultra-precision machining of non-ferrous metals, optical components, molds and other parts, by utilizing a sharp single crystal diamond tool, optical surface quality can be obtained only by one-time processing. Therefore, natural single crystal diamond tool is considered to be an ideal precision tool in the field of ultra-precision machining . Ferrous metals refer to iron, chromium, manganese and their alloys, such as bearing steel, stainless steel, die steel, etc. These are the most widely used metal materials around the world so far. However, natural diamond tools produce extremely severe wear when machining ferrous metals, which greatly restricts the development of ultra-precision cutting technology for ferrous metals . Researchers have not agreed on the mechanism of diamond tool wear when cutting ferrous metals, but it is concluded that the chemical wear of diamond tool is the key factor cannot be ignored. On the one hand, the high chemical affinity between workpiece materials and diamond tool is considered a prerequisite for tool chemical wear. On the other hand, complex thermal effects during cutting process tend to accelerate the process of tool chemical wear. These factors lead to diamond in a metastable state tends to transform into stable layer graphite simultaneously under the catalysis of ferrous metals . There are two ways to reduce the wear of diamond tools: one is to reduce the thermal effect of the cutting area as much as possible, and the other is to reduce the chemical affinity between the tool and the workpiece. Specifically, the methods mainly involve three aspects, process modification, workpiece modification and tool modification . In the process of diamond-cutting ferrous metals, tool wear suppression methods include: cryogenic turning, turning in protective gas atmosphere, improving lubricating medium, ultrasonic elliptical vibration cutting, etc. The purpose of cryogenic turning is to reduce the cutting temperature and decrease the thermal impact between tool and workpiece. Studies have shown that the high temperature will significantly accelerate the wear rate of diamond tools . The cryogenic methods include: liquid nitrogen, dry electrostatic and cold plasma. The liquid nitrogen is performed by spraying liquid nitrogen (temperature is about -200 °C) directly to the cutting zone. Although the cooling effect of liquid nitrogen is obvious, simultaneously it may lead to the deformation of workpiece. Dry electrostatic and cold plasma are similar in principle, both of them utilize ionized compressed air to generate active particles, and spray them into the cutting zone to realize the aim of cryogenic turning. Turning in protective gas atmosphere refers to the completion of the cutting process in a carbon-rich gas atmosphere. To a certain extent, the carbon-rich gas can inhibit the diamond graphitization process, thereby reducing the wear of the diamond tool. The carbon-rich gas mainly used for researching includes CH4, C2H2, CO2, etc. The effect of CH4 is most obvious, but the danger of explosion limits its application. In addition, studies have shown that inert gas (helium, argon) cannot inhibit tool wear in the process of diamond-cutting ferrous metals . There are two ways to improve lubricating ability: First, by mixing compressed air and lubricating oil and spraying mixture to the cutting zone under a certain pressure, the minimum quantity lubrication (MQL) has been used widely in the field of ultra-precision machining to improve the cooling and lubricating ability of cutting fluid . Second, researchers prepared a new cutting fluid by adding an appropriate amount of carbon nanoparticles to the cutting fluid. It can form a carbon protective film on the surface of the diamond tool to inhibit tool wear . Ultrasonic elliptical vibration cutting, an intermittent cutting method. The tool is vibrated by elliptical trajectory, and it can realize complete separation of the tool and chip during each vibration cycle, so that the process of chemical wear of diamond tool will be interrupted periodically. Further the temperature of cutting is reduced, and the cryogenic effect of the interface between the tool and the workpiece is more obvious, so the wear of diamond tool is much smaller than turning . However, it should be pointed out that ultrasonic cutting efficiency is limited seriously, also residual vibration patterns on the machined surface are inevitable. Workpiece surface modification generally refers to the improvement of the material properties of the ferrous metal surface layer by thermochemical process, further a compound layer is formed on the surface of the material. The compound layer has minimal affinity for the diamond tool and is easy to be machined, at the same time the material matrix portion remains in its original state. The method achieves the reduction of the wear of the diamond tool. The main methods of workpiece surface modification include: plasma nitridation and surface boronizing treatment . However, due to the uneven depth of the modified layer or the incomplete removal of the modified layer in process of turning, it may lead to differences in residual stress and microhardness between the workpiece surface and the matrix. To a certain extent, the performance of workpiece may be degraded. Tool modification mainly involves two aspects: protective coatings and ion implantation. The protective coating is coated on the surface of the tool to prevent the diamond tool from directly contacting the workpiece. Currently, the coatings applied to the diamond tool mainly include: TiN, TiC, TiAlN. However, these coatings’ adhesive strength is relatively restricted, further the edge radius of diamond tool will be increased, which will reduce the cutting performance of tool . Ion implantationrefers to the injection of high-energy nitrogen ions, chromium ions and titanium ions on the surface of diamond tools to improve the surface properties of diamond tools, further this method enhances the wear resistance of diamond tools. However, the defects introduced into the diamond tools may be inevitable, and the actual feasibility is a little poor. S. Huang; Research on Diamond Cutting of Ferrous Metals assisted by Clod Plasma. Dalian University of Technology2017, DaLian,China. Y. H. Zhou; Z. Qin; C. Y. Wang; Study on performance and application of diamond tools. Machinery Design & Manufacture2009,6,158-160, 10.3969/j.issn.1001-3997.2009.06.061. E.Brinksmeier; R.Gläbe; L.Schönemann; Review on diamond-machining processes for the generation of functional surface structures. CIRP Journal of Manufacturing Science and Technology 2012, 5, 1-7, 10.1016/j.cirpj.2011.10.003. H. J. Zhang; M. Zhou; Tool Wear in Diamond Cutting Sinusoidal Microstructured Surfaces. Key Engineering Materials 2010, 431, 94-97, 10.4028/www.scientific.net/kem.431-432.94. B.M. Lane; T.A. Dow; R. Scattergood; Thermo-chemical wear model and worn tool shapes for single-crystal diamond tools cutting steel. Wear 2013, 300, 216-224, 10.1016/j.wear.2013.02.012. L. Zou;Research on Tool Wear and its Inhibition in Diamond Cutting of Ferrous Metals. Harbin Institute of Technology2015,Harbin,China. L. J. D.Oliveira; G.S.Bobrovnitchii; M. Filgueira; Processing and characterization of impregnated diamond cutting tools using a ferrous metal matrix. International Journal of Refractory Metals and Hard Materials 2007, 25, 328-335, 10.1016/j.ijrmhm.2006.08.006. E. Paul; C. J. Evans; A. Mangamelli; M. L. McGlauflin; R. S. Polvani; Chemical aspects of tool wear in single point diamond turning. Precision Engineering 1996, 18, 4-19, 10.1016/0141-6359(95)00019-4. S. Shimada; H. Tanaka; M. Higuchi; T. Yamaguchi; S. Honda; K. Obata; Thermo-Chemical Wear Mechanism of Diamond Tool in Machining of Ferrous Metals. CIRP Annals 2004, 53, 57-60, 10.1016/s0007-8506(07)60644-1. M. Uemura; An analysis of the catalysis of Fe, Ni or Co on the wear of diamonds. Tribology International 2004, 37, 887-892, 10.1016/j.triboint.2004.07.004. R. Narulkar; S. Bukkapatnam; L.M. Raff; R. Komanduri; Graphitization as a precursor to wear of diamond in machining pure iron: A molecular dynamics investigation. Computational Materials Science 2009, 45, 358-366, 10.1016/j.commatsci.2008.10.007. Z. J. Li; F. Z. Fang; H. Gong; X. D. Zhang; Review of diamond-cutting ferrous metals. The International Journal of Advanced Manufacturing Technology 2013, 68, 1717-1731, 10.1007/s00170-013-4970-5. S. Shimada; N. Ikawa; M. Yoshinaga; H. Tanaka; Wear Mechanism of Diamond Cutting Tool in Machining of Steel. Key Engineering Materials 2001, 196, 69-78, 10.4028/www.scientific.net/kem.196.69. C. Evans; J.B. Bryan; Cryogenic Diamond Turning of Stainless Steel. CIRP Annals 1991, 40, 571-575, 10.1016/s0007-8506(07)62056-3. E. Brinksmeier; R. Gläbe; Advances in Precision Machining of Steel. CIRP Annals - Manufacturing Technology 2001, 50, 385-388, 10.1016/s0007-8506(07)62146-5. X. Liu;Basic Research on Mechanism and Application of Ionized Gas Jet Assisted Cutting. Dalian University of Technology2012,DaLian,China. J.M. Casstevens; Diamond turning of steel in carbon-saturated atmospheres. Precision Engineering 1983, 5, 9-15, 10.1016/0141-6359(83)90063-6. M.P. Hitchiner; J. Wilks; Factors affecting chemical wear during machining. Wear 1984, 93, 63-80, 10.1016/0043-1648(84)90178-9. N.R. Dhar; M.W. Islam; S. Islam; M.A.H. Mithu; The influence of minimum quantity of lubrication (MQL) on cutting temperature, chip and dimensional accuracy in turning AISI-1040 steel. Journal of Materials Processing Technology 2006, 171, 93-99, 10.1016/j.jmatprotec.2005.06.047. A. Inada; S. Min; H. Ohmori; Micro cutting of ferrous materials using diamond tool under ionized coolant with carbon particles. CIRP Annals 2011, 60, 97-100, 10.1016/j.cirp.2011.03.089. 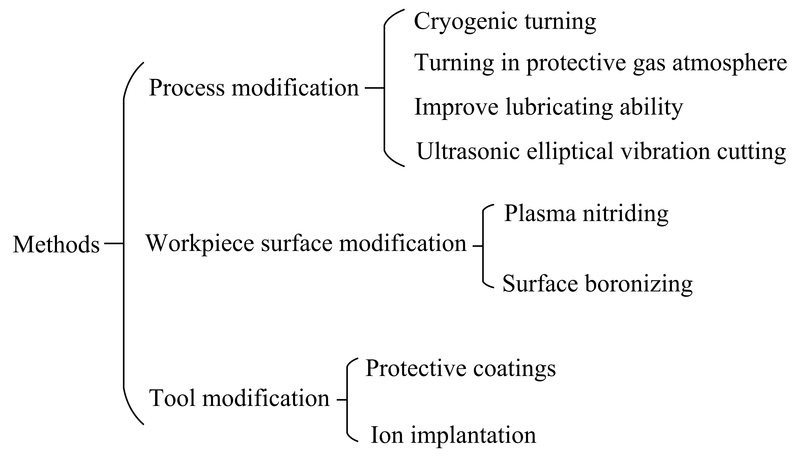 T. Moriwaki; E. Shamoto; Ultraprecision Diamond Turning of Stainless Steel by Applying Ultrasonic Vibration. CIRP Annals 1991, 40, 559-562, 10.1016/s0007-8506(07)62053-8. E. Brinksmeier; R. Gläbe; J. Osmer; Diamond Cutting of FeN-Layers on Steel Substrates for Optical Mould Making. Key Engineering Materials 2010, 438, 31-34, 10.4028/www.scientific.net/kem.438.31. H.R. Stock; V. Schlett; J. Kohlscheen; P. Mayr; Characterization and mechanical properties of ion-implanted diamond surfaces. Surface and Coatings Technology 2001, 146, 425-429, 10.1016/s0257-8972(01)01479-7.